Why Is Coffee Called Joe? For years, many of us have heard the term “cup of joe” being thrown around in regard to coffee. However, not many of us know where that term has come from. Unlike other nicknames like “java“, there isn’t a distinct origin, location or other source. It can really leave a lot of us scratching our heads about the term! To help with figuring it out, we’ve taken a look into this matter to discover where this unique nickname really came from. You’ll surely be able to entertain friends at coffee gathering with this interesting trivia tidbit! Read on to learn more about where this popular coffee nickname came from! Those who have been studying the background behind the term “joe” have largely been unable to connect it back to just one source. There are actually multiple areas and situations where the term may have come from. In addition, these different theories on the origin of the well-known coffee nickname are actually quite interesting. From the standard evolution of language to jokes and marketing sources, there are so many places this name may have come from! 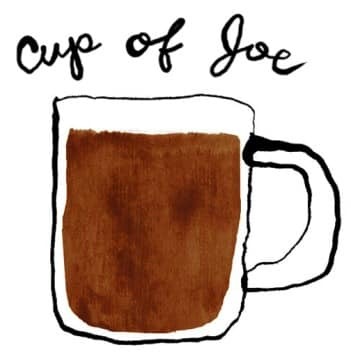 Some believe it may largely be due to a coffee company, while others figure “joe” to be shortened versions of other names or even refer to a class of person drinking it. There are many ways that words like these can evolve over time. In some cases, it can be hard to make the connection back to why a specific word came to be. For example, hundreds of years from now people may look back and wonder about some of our unique words. Like this Post? You may also like the following posts on small burr grinders and airtight coffee canisters. Just as we have words now that didn’t exist decades ago, there are also words from those times that have lingered on. Though we may not always know the exact origin, many of these words just come from an evolution of linguistics. One potential source of the name “joe” refers to many who drink it. Often times, the working man or “average joe” has to get up early to prepare for a long work day. Back in the earlier days of coffee, it was also more often the case that these work days would be longer than what we expect today. Because of that, coffee was a drink of choice for such people to help give them a boost for their day. As such, we can see there the term “joe” might come from. That said, there is another potential linguistic source of this word that also makes sense. Before “joe” was a common term, some would use other nicknames like “mocha” or “java”. Over time, some combined these terms into the nickname “jamoke”, to cover all the basis. This makes sense when we consider those looking for a catch-all name to cover all varieties of coffee. To further shorten the name, over time “jamoke” may have simply become “joe”. We may also find that the term comes from a combination of both of these linguistic changes. Or, it could be these in combination with other types of historical sources. It’s hard to tell when and where words originated because they often begin orally rather than on paper, so they aren’t as easy to track. There are also some other possibilities with regard to this term, starting with potential marketing for a company. Keep reading for more or see these posts on the convenience of removable tank coffee makers and small coffee carafes. Another potential source of origin is in regard to a coffee company that was founded in 1898. The company was known as Martinson Coffee and was owned by a man named Joe Martinson. Some say that Joe was a man with a big personality, which would aid in marketing endeavors. Furthermore, it’s possible that in the area of New York where the company was started that people may have referred to Martinson coffee as “Joe’s Coffee”. From that, it’s not hard to see where a term like “cup of joe” could come from. There are a lot of situations today in which similar kinds of names have become widely popular in place of the actual name of the product. For example, many of us refer to adhesive bandages as “Band-Aids” even though this is actually the brand name rather than the name of the item. The same occurs for “Q-Tips”. Though these are brands and not the name of the brand owners themselves, we can see how it would be easier to adopt the name “joe” for coffee rather than using the actual Martinson brand. However, there is very little evidence to support this origin fully. There may be a chance that it contributed somewhat, but it’s unlikely that this alone caused the popularity of the term “cup of joe” nationwide. Most of the evidence that has been found that contributes to this theory is through advertising and other writings created by the company themselves. Because of that, it’s hard to tell whether or not customers actually used these terms. Another source for this term, some may find particularly interesting. According to this origin, the word began within the U.S. Navy near the beginning or World War I. To be more specific, in the year of 1914. At this time, a man by the name of Josephus Daniels worked as the secretary of the Navy. Daniels made the choice to ban all alcohol from the ships, likely as a method of keeping soldiers more aware at all times. Such a decision might make sense in an environment where unexpected battle might be possible. However, there were many who disagreed with this ruling. Because of that, there were likely to be grumblings as well as jokes made by the soldiers pointed toward Daniels. One such example would be referring to coffee as a “cup of joe” because without alcohol, it would have been the only beverage available that could create any kind of physical reaction. Therefore, using this term would have been a way to get a sly jab in at the secretary without confronting the man directly. More than likely, many soldiers appreciated the ability to take the edge off a long day at a local bar or even at home. However, no such relaxation was available once they boarded the Navy ships. It’s not really a surprise that soldiers would be grumbling about this resource being taken away from them. One issue with this origin, however, is that there is quite a large time gap between this ruling and the growth in popularity in the term “joe” being used for coffee. While it is possible it just took time to gain traction, this might also be evidence that maybe this tale isn’t the exact source of the word. Though this origin may not be the most accurate, it does bring up the idea of just how important coffee can be within the realms of the military. Because the term “cup of joe” was initially created and spread through oral means, it’s difficult to track it back to a direct source. It could have stemmed from anything from a Navy joke to simple evolution or linguistics. Or, there may be a cause we simply don’t know about as the vast majority of us weren’t there when it began to grow in popularity. That said, it is interesting to know where the potential sources for this word might be. It’s largely going to be up to you, the reader, to decide which one sounds like it’s the most likely situation. Or perhaps, it’s any combination of those listed here and more. In any case, you can enjoy your cup of joe while entertaining the stories that come with the popular term.